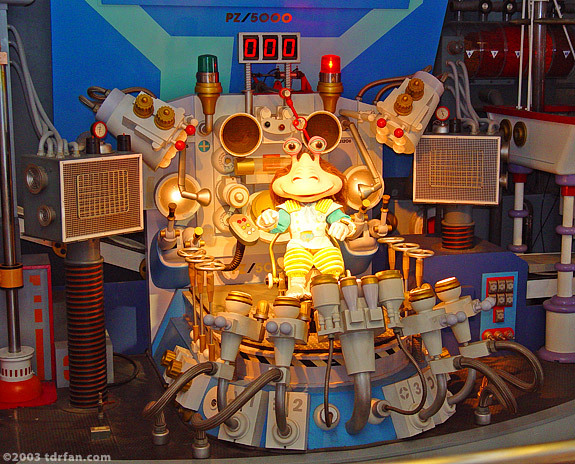 Here's a real Tokyo Disneyland original—and a great one at that. Pan Galactic Pizza Port is one of three restaurants in Tokyo Disneyland that serves pizza, but it's far and away my favorite. The reason is not because it's got the best tasting pizza (although in my opinion it does), but because the restaurant is built around a giant, animated pizza-making machine run by a colorful alien named Tony Solaroni (from the Spumoni galaxy). The fanciful pizza making machine is more than just an interesting ornament. Every few minutes an entertaining event will occur—it might be a futuristic television commercial for the Pizza Port, or a phone call from Tony's equally alien wife, or the pizza making machine might go berserk. All of the events are delightful to watch, and are accompanied by terrific animations on the group of television sets just above Tony's head. There are a two varieties of pizza here; chicken and vegetable, or sausage and mushroom, both served by the slice. My favorite is the sausage and mushroom, and it's also my recommendation if you favor Western-style pizza. There are a few side dishes, the most notable of which is the seafood salad; be forewarned that octopus and seaweed are prominent ingredients. If you're going to eat here you really should sit upstairs. There's usually more available seating, but the real reason to sit up there is that you get a much better view of the show.